KANSAS CITY, MO--(Marketwire - September 15, 2010) - Holland 1916 is pleased to announce the Data Cinch, an extremely durable, RFID enabled, steel cable locking zip tie. 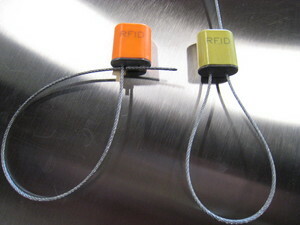 The Data Cinch is a great product for RFID enabling almost any type of asset that will be exposed to harsh conditions. The Data Cinch comes with either a 1/16th inch steel cable offering a pull strength of approximately 800 lbs or a 1/8th inch steel cable offering a pull strength of approximately 1,000 lbs. Holland 1916 offers the Data Cinch embedded with either a HF RFID tag or a UHF RFID tag. To see the outstanding durability of the Data Cinch, please visit Holland 1916's YouTube channel at http://www.youtube.com/user/Holland1916 or our blog at http://rfidsolutionsformetal.wordpress.com/. Holland 1916 Inc. is a rapidly growing manufacturer of product identification items such as nameplates, industrial RFID carriers, panels, consoles, enclosures, overlays, membrane switches, touch screens and die cast parts for original equipment manufacturers (OEMs). Our products are typically used to convey brand information, identify a product, provide safety data, communicate operating instructions or serve as the electronic interface. Since 1916, Holland 1916 has served customers, large and small, from a diverse set of industries ranging from oil & gas, to medical, to transportation. Holland's headquarters and manufacturing facility are located in North Kansas City, Mo. For more information, call (800)633-3046 or (816)421-4553. Email us at sales@holland1916.com or visit www.holland1916.com.